Freezer-Aisle Breakfast Find, Night Cravings Explained, Low-Calorie Cocktails & MORE! Weight Watchers Smart Ones Smart Beginnings Oatmeal - Oh, freezer-aisle oatmeal, you make us happy! 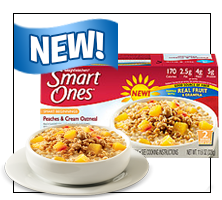 The smarties over at Smart Ones have new b-fast bowls of oatmeal (made with steel-cut and rolled oats) topped with fruit and granola: Peaches & Cream, Apples & Cinnamon, and Maple & Brown Sugar. Each serving has 170 - 190 calories, 2 - 2.5g fat, 170 - 190mg sodium, 32 - 38g carbs, 4 - 5g fiber, 13 - 16g sugars, and 5g protein (PointsPlus® value 4 - 5). Oat-standing! Fruttare Ice Bars and Fruit & Milk Frozen Dessert Bars - This new line of freezy treats has us so excited for warm weather... The fresh 'n fruity ice bars come in Mango, Lime, Orange, and Strawberry, each with 60 - 70 calories, 0g fat, 0mg sodium, 15 - 18g carbs, 0 - <1g fiber, 11 - 14g sugars, and 0g protein (PointsPlus® value 2*). The sweet 'n creamy milk bars come in Strawberry, Peach, Coconut, and Banana. Each one has 110 - 140 calories, 3 - 5g fat, 45 - 65mg sodium, 20 - 22g carbs, 0 - <1g fiber, 16 - 18g sugars, and 1 - 2g protein (PointsPlus® value 3 - 4*). So cool, they're hot! Dei Fratelli Truly Veggie Juices - When it comes to tomato products, Dei Fratelli has got it goin' on. (The sauces rock!) And these new not-from-concentrate juices are totally tasty. In both Tomato and Veggie, an 8-oz. serving has 40 - 45 calories, 0g fat, 450 - 480mg sodium, 10 - 11g carbs, <1 - 1g fiber, 9g sugars, and 2g protein (PointsPlus® value 1*). Find DF items in midwestern, central, and southeastern states, or just buy 'em online! Late-Night Snack Cravings: Where Do They Come From? 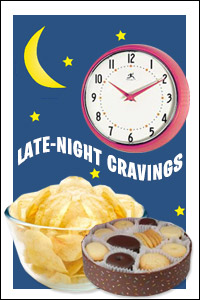 Chances are, at one point or another, you've found yourself wrestling with junk-food cravings once the sun goes down. Researchers set out to determine what causes this phenomenon, and the findings are very interesting. A person's internal clock (a.k.a. circadian system) actually increases both overall hunger and specific cravings for sweet, starchy, and salty foods in the evening. It also makes us more likely to skip breakfast and have a big dinner... which is apparently what Sumo wrestlers do to gain weight! Another factor? Artificial light often means we stay up later, leaving us vulnerable to those physiological cravings. And since our bodies store more energy (read: calories) in the evening than they do in the daytime, feeding the night cravings is tied to weight gain. Eeeks! So how do we fight our mean ol' circadian clocks? One doctor from the study suggests the following to sidestep those cravings and avoid weight gain: Eat larger, higher-calorie meals early in the day, and keep dinner lighter and lower in calories. Then turn off the lights, and get plenty of sleep! Click here for smart picks when you just can't resist those late-night cravings. Malibu 70 Calories Island Spiced Rum - Are you a fan of spiced rum? There's a light option in town! Sweetened with a touch of Truvia, a 1.5-oz. shot has just 70 calories (PointsPlus® value of about 3*). It's a little coconutty with a bit of vanilla and cinnamon... Really good! Smirnoff Sorbet Light Vodka - These sherbet-colored bottles of fruity libations come in three flavors: Mango Passion Fruit, Lemon, and Raspberry Pomegranate. Mmmmm! And each 1.5-oz. shot has a mere 78 calories (PointsPlus® value of about 3*). Bet these would be great with some Sprite Zero or Trop50! - After sampling a few of Daily's new ready-to-drink frozen cocktails, this flavor emerged as the HANDS-DOWN favorite. A single-serving 10-oz. pouch has 180 fat-free calories. Pre-mixed, portion-controlled cocktails? Cool! Bacardi Classic Cocktails Light Strawberry Daiquiri - Prefer your ready-made daiquiris on the rocks? Say no more! This low-calorie beverage has less than 95 calories for a 4-oz. serving. It joins Light Piña Colada and Light Mojito in Bacardi's lineup. Par-tay! HG FYI: Since the PointsPlus® values for alcoholic beverages need to be specially calculated by Weight Watchers, we don't have official values for these brand-new products. We estimated the values for the straight-up spirits based on their relation to full-calorie liquors! Look who's getting in on the HG dessert book action! Here's Lisa with pals Jennette McCurdy and Ariana Grande, of iCarly, Victorious, and (coming soon) Sam & Cat! SWEET!!!! ***Now available at Dairy Queen... Orange Julius Light Smoothies! They come in eight great flavors, and each small smoothie has 140 - 170 calories and no fat (PointsPlus® value 4 - 5*). We've got our eye on the Mango Pineapple... Just make sure you get a LIGHT one! ***HG REMINDER! The Hungry Girl 200 Under 200 Just Desserts book tour continues TONIGHT in NEW YORK CITY! Come hang out with Lisa (HG herself!) at the Barnes & Noble at 86th and Lex. Enjoy free treats, sweet prizes, and more. California, you're next! Click for details. ***Listen up, gum chewers: The FDA recently launched an investigation into the safety of caffeine-enhanced foods, and as a result, Wrigley has taken its new caffeinated gum, Alert, off the market for the time being. Respectable decision, Wrigley! There are quite a few snacks with caffeine boosts out there. We wonder if they'll follow suit... ***Ready for your weekly dose of nonsense? Prepare for sushi cats. You read that right. Sushi cats! Click and peruse pictures of cats atop pillows of rice, wrapped with strips of seaweed, as if they were... sushi. (Oh, don't worry! We're pretty sure these were Photoshopped.) Why is this a thing? Why does one have a Ping-Pong paddle on its back? Aah, the mysteries of the interweb. That's all we've got. HG out! Chewin' Whoopie Pies with HG Lisa! Pass around this invaluable info! Click "Send to a Friend" NOW. TUNE-IN ALERT! Tomorrow, Tuesday, 5/14, HG Lisa returns to the TODAY show, where she’ll be hanging with Kathie Lee and Hoda for the first time ever! She'll be dishing out desserts from the new book, like Yum Yum Red Velvet Brownie Muffins and White Chocolate Raspberry Crunchettes. It all happens during the 10 a.m. hour!